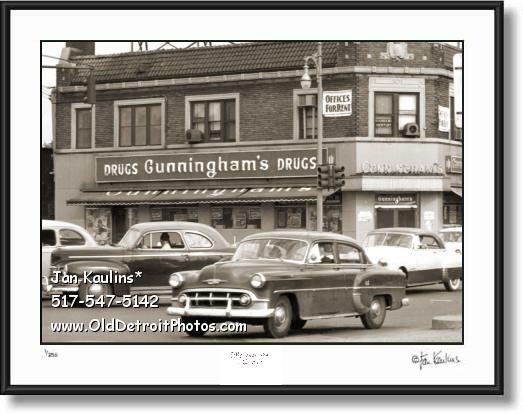 CUNNINGHAM'S DRUG STORE Detroit photo picture print photography for sale. This DETROIT CUNNINGHAM'S DRUG STORE photo picture print for sale is made from the professionally restored original 1954 negative/photo. Cunningham's Drugs opened in Detroit, Michigan, in 1889 and eventually became the state's largest drug store chain. They expanded into a few other states as well, but hard times befell the chain, and the last remaining Cunningham's – all located in Florida – were shuttered in 1991. This is an excellent vintage image from 1954 of the Cunningham's in Highland Park, a Detroit suburb, with vintage vehicles on the street.